The hectic annual shopping frenzy...otherwise know as Black Friday (and now increasingly Cyber Monday) is fast approaching. Does this annual event attract long term customers to your brand, and if not, how can you turn these seasonal shoppers into brand advocates? Not actually “a thing” in the UK until 2010 when Amazon introduced us to the joys (or otherwise) of this short term shopping event. Many retailers have mixed feelings about Black Friday and 2015 saw some interesting changes in the approach retailers (and their customers) took. Some opted out completely. One US retailer even closed their shops completely! Whatever your thoughts on Black Friday, it looks like it’s here to stay. In fact a report by eConsultancy suggest that Brits have truly embraced the concept and now spend more per capita than their transatlantic counterparts. In the last two years Mention Me has seen a huge increase in Black Friday transactions from retail clients compared to the previous year. So we look at 5 aspects of Black Friday and how referrals can help you turn it into a longer term customer recruitment and retention tool. With some pretty shocking scenes of consumerism gone bad in 2014, last year saw a change in the way customers approached Black Friday. Rather than risking the bun fight in the stores, more people chose to do their shopping from home. In the US, a tipping point was reached, whereby more sales took place online than in stores. In the UK £1.1billion was spent online,up 36% on the previous year. With such large volumes of sales taking place online, why wouldn’t you take the opportunity to harness the goodwill, spread word of mouth, and even capture some interesting insights into your customers. When shopping takes place away from stores, companies have less opportunity to build a personal relationship with their customers. 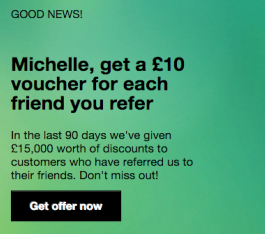 A referral scheme gives you the chance to keep in contact, offer exclusive offers and reward loyal customers. The typical Black Friday deals are often big discounts of high tickets items. These might be compelling in terms of getting short terms sales, but they are unlikely to drive any brand loyalty. In fact quite the opposite; it might cheapen your brand and just attract bargain hunters. But it doesn't have to be this way. Many successful retailers are now offering exclusive loyalty based Black Friday deals to existing customers. Referral marketing can enable you to develop exclusive offers for your most valuable customers. This is much more likely to build long term loyalty and will be a gateway to acquiring your new customers. Why not develop an offer for your existing customers to give them something exclusive if they share an offer with their friends around Black Friday? Their friends will see this as a more exclusive offer rather than the blanket offers which struggle to be heard amongst the noise. Focusing on Black Friday (or even Cyber Monday) alone, won’t build long term lasting relationships with your customers. In fact, you might experience the opposite effect, whereby potential customers hold off purchases in the knowledge they can pick up a last minute bargain. Smart companies look at Black Friday as part of their wider strategy and look at their customer lifetime value (LTV). Referral marketing gives you an opportunity to engage with your most loyal customers and give them a reward for sharing with their friends. During a key retail event such as Black Friday this can develop into a virtuous circle whereby the customer is rewarded and comes back at another key time. Perhaps they might buy that specially priced TV and return in the lead up to Christmas to purchase other small electrical items. We discussed this phenomenon in a previous post centred around Valentine’s Day and Mother’s Day. Referral marketing can have a big impact on customer lifetime value. Across a number of retail clients, we have found that customers who have received a referrer reward are 54% more likely to buy again than someone who hasn’t become a referrer. That’s sure to make your customer LTV look healthier! Social Media sees an explosion in posts leading up to Black Friday. It was reported by Chris Kerns, Spredfast director of analytics and research, that there were over 1.4 million tweets referencing Black Friday in the seven weeks leading up to it up 15% on the previous year. Social media is obviously a key tool for sharing referral offers, so it is an ideal time to harness this increase in activity. In addition to this increase in reported tweets there are also likely to be discussions taking place in private messaging apps, otherwise known as dark social (something we covered in a previous post). Make sure you have a referral programme which can harness all these sharing methods to maximise on the opportunity. And why not set up specific Black Friday share messages so that you can track future sales back to the retail event? What drives customers into the shopping frenzy associated with Black Friday? The event is designed around scarcity, and customers perceive scarce items to be more valuable. Retailers play on this by highlighting the limited number of items available or the numbers already sold. This drives people to act in ways in which they might not normally. As this BBC article outlines, “this can lead to frustration when people miss out on what they wanted to buy”, especially if they put a lot of planning into obtaining that bargain. The psychology surrounding Black Friday can easily be replicated in referral marketing throughout the year…. But without the aggressive response. Scarcity forms one of the “6 weapons of influence” outlined in Robert Cialdini’s "Influence: The Psychology of Persuasion". It can be built into your referrals offers by limiting the redemption period. Other weapons seen in Black Friday, such as social proof, are a key element which make referrals so successful. Knowing that others have taken up an offer and trust the brand can be compelling reasons to make a purchase. Take a look at our Psychology of Referral series for other ideas to steal. You’re sure to have already started planning your approach to Black Friday. Just make sure you harness the huge increase in traffic and sales with an eye on the future and not just for short term gain. 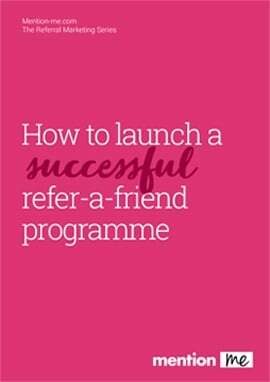 A referral programme can establish you as a brand to trust who rewards genuine loyalty. With referral in place your Black Friday volume can easily be turned into the gift that keeps on giving….